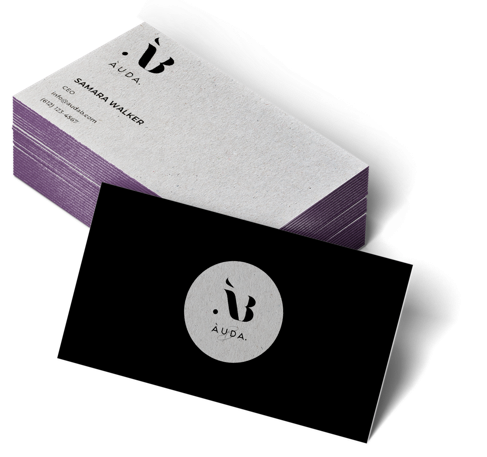 Àuda.B is an up and coming Beauty Tech company focused on inclusion and diversity while using technology to change the standards & dynamics of beauty, by integrating services, virtual beauty, and products. Àuda.B offers luxury vegan products and focuses on health while incorporating fashion trends inspired by runway collections and pantone. The visual identity for Àuda.B was designed from the ground up, focusing on a mark that communicated its brand personality: bold, beautiful, and luxurious. The identity is made up of two parts, a wordmark and a monogram, providing the brand with enough room to enter a competitive market and stand among its competitors. After extensive brand research, a design was put together that would help push Àuda.B to the next level.